A delightful Christmas Book for the Whole Family. 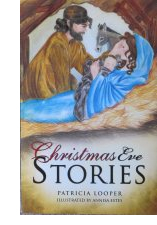 Pat Looper, a friend of mine and member of a Christian Writing Group I ran in North Carolina a few years back, has published a book of Christmas stories she worked on with us. It is both for adults and children with themes circling around secondary characters in the Biblical account and how the Nativity inspired their lives.Pat has many degrees in theology, so it is not a sentimental book you wouldn’t like. The illustrations are done by an excellent artist.